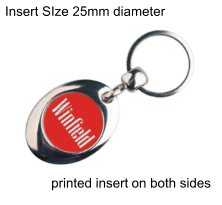 Keyrings are a tremendous marketing tool promoting your company, band or message to potentially thousands of people, making them a cost effective and inexpensive form of advertising. They can also be used as a personalised gift or for a special occasion such as birthdays, hen/stag nights or wedding favours. Full Colour Print - On paper inserts to both sides - up to 2 different designs can be used. We print using CMYK printers. Artwork that has been supplied in RGB format will have to be converted to CMYK and this can have an effect on colours. Artwork Design - If you don't have any artwork and have an idea/logo/photo/text, we can turn it into a design for you. Artwork Samples/Artwork Set-Up - Once you have placed and paid for your order you will be emailed your artwork sample(s) for approval before your keyrings are produced. Standard Delivery on all UK orders - Postage upgrades are available if you have a specific deadline to meet, we show estimated dispatch dates in the shopping basket. Our stylish QBMP-25D metal keyrings offer all the benefits of the acrylic range and add a touch of class to any promotion or occasion. Prices include full colour print and postage in the UK.